The Basque Country - Euskadi / País Vasco / Pays Basque is an autonomous community of northern Spain. It includes the Basque provinces of Álava, Biscay and Gipuzkoa, also called Historical Territories. The Basque Country or Basque Autonomous Community was granted the status of nationality within Spain, attributed by the Spanish Constitution of 1978 to separate ethnic realities. The autonomous community is based on the Statute of Autonomy of the Basque Country, a foundational legal document providing the framework for the development of the Basque people on Spanish soil. Notwithstanding this spirit, the territory of Navarre was left out and made into a separate autonomous community. The capital is Vitoria-Gasteiz (Vitoria is the name in Spanish, Gasteiz in Basque), located in the province of Álava, and Bilbao its largest city, located in the province of Biscay. The legal jurisdiction of the Autonomous Community of the Basque Country should not be confused with the cultural larger Basque Country (Basque: Euskal Herria), the name given to the home of the Basque people, of which it is a component part. The Basque Country borders with Cantabria and the Burgos province to the west, the Bay of Biscay to the north, France and Navarre to the east and La Rioja (the Ebro River) to the south. The territory has three distinct areas, that are defined by the two parallel ranges of the Basque Mountains. The main range of mountains forms the water divide of the Atlantic and Mediterranean basins. The highest point of the range is in the Aizkorri massif (1551 m). 1 – Atlantic Basin – formed by many valleys with short rivers that flow from the mountains to the Bay of Biscay, like the Nervión, Urola orOria. The coast is rough, with high cliffs and small inlets. The main features of the coast are the Bilbao Abra Bay and theEstuary of Bilbao, the Urdaibai estuary and the Bidasoa-Txingudi Bay that forms the border with France. 2 – Middle Section – Between the two mountain ranges, the area is occupied mainly by a high plateau called Llanada Alavesa (Álava plains) where the capital Gasteiz is located. The rivers flow in southern direction from the mountains to the Ebro river. The main rivers are the Zadorra and the Bayas. 3 – Ebro Valley – from the southern mountains to the Ebro is the so-called Rioja Alavesa, that shares the Mediterranean characteristics of other Ebro Valley zones, here is produced part of the Rioja wine. The Basque mountains form the water divide and mark also the distinct climatic areas of the Basque Country: The northern valleys, in Biscay and Gipuzkoa and also the valley of Ayala in Álava, are part of the Green Spain, where oceanic climate is predominant, with its wet weather all year round and moderate temperatures. Precipitation average is about 1200 mm. The middle section has a greater influence of a Continental climate, but with a varying degree of the northern oceanic one, this causes dry and warm summers and cold and snowy winters. The Ebro valley has a pure Continental climate, winters are cold and dry and summers very warm and dry, with precipitation peaking in spring and autumn. Precipitation is scarce and irregular, as low as 300 mm. Almost half of the 2,155,546 inhabitants of the Basque Country live in Greater Bilbao, Bilbao’s metropolitan area. Of the ten most populous cities, six form part of Bilbao’s conurbation (Bilbao, Barakaldo, Getxo, Portugalete, Santurtzi and Basauri), which is also known as Greater Bilbao. At 28.2% of the Basque population born outside this region, immigration is crucial to Basque demographics. Over the 20th century most of this immigration came from other parts of Spain, typically from Galicia or Castile and León. Over the last years, sizeable numbers of this population have returned to their birthplaces whereas immigration to the Basque country currently originates abroad, chiefly from South America. Spanish and Basque are co-official in all territories of the autonomous community. The Basque-speaking areas in the modern-day autonomous community are set against the wider context of the Basque language, spoken to the east in Navarre and the French Basque Country. The whole Basque speaking territory has experienced both decline and expansion in its history. Basque language experienced a gradual territorial contraction throughout the last nine centuries,and very severe deterioration of its sociolinguistic status for much of the 20th century due to heavy immigration from other parts of Spain, the virtual nonexistence of Basque language schooling, and the national policies implemented by the dictatorial Franco Fascist Régime. After the advent of the Statute of Autonomy of the Basque Country in 1982 following Franco’s death, this reductive trend was gradually reversed thanks to the Basque language schools and the new education system. Basque has always had a strong presence in most of Gipuzkoa, central and eastern Biscay and the northern edge of Álava. Before the Spanish Constitution of 1978 and its system of autonomous communities, these three provinces were known in Spanish as the Provincias Vascongadas since 1833. The political structure of the new autonomous community is defined in the Gernika Statute, which was approved by a majority in a referendum held on 25 October 1979. As regards the bounds to the Spanish Constitution, Basque nationalists cite the fact that in the 1978 Spanish Constitution referendum, which was passed with a majority of votes and a poor turnout in this area, the Basque Country had the highest abstention (the Basque Nationalist Party had endorsed abstention on the grounds that the Constitution was being forced upon them without any Basque input). To this, the “NO” vote in this referendum was also higher in the Basque Country than in the rest of the state. All in all, many Basques believe that they are not bound to a constitution that they never endorsed. The Statute of Autonomy of the Basque Country is a constitutional law but powers have been devolved gradually during decades according to re-negotiations between the Spanish and the consecutive Basque regional governments to reach an effective implementation, while the transfer of many powers are still due and has always been a matter of heated political discussion. Basque nationalists often put down this limitation in the devolution of powers to concessions made to appease the military involved in the 23-F coup d’état attempt (1981). In 2003, the governing Basque Nationalist Party (PNV) proposed to alter this statute through the Ibarretxe Plan. The Ibarretxe bill, was approved in the Basque Parliament after much discussion, as it was subject to lengthy legal objections (on the grounds that it contradicts the Spanish Constitution), but it was subsequently rejected in the Spanish Parliament (Madrid Cortes Generales) in January 2005 by a large majority. Since the first autonomic cabinet, the Basque Nationalist Party has led office in the Basque Autonomous Community except for a 2009-2012 term, led by Patxi Lopez (PSE-PSOE). The current basque prime minister is Iñigo Urkullu, also member of the Basque Nationalist Party. The Basque Autonomous Community ranks first in Spain in terms of per capita income, with gross domestic product (GDP) per capita being 40% higher than that of the European Union and 33.8% higher than Spain’s average in 2010, at €31,314. Industrial activities were traditionally centered on steel and shipbuilding, mainly due to the rich iron ore resources found during the 19th century around Bilbao. The Estuary of Bilbao was the center of the Basque Country’s industrial revolution during the 19th and the first half of the 20th century. These activities decayed during the economic crisis of the 1970s and 1980s, giving ground for the development of the services sector and new technologies. Today, the strongest industrial sectors of the Basque Country’s economy are machine tool, present in the valleys of Biscay and Gipuzkoa; aeronautics in Vitoria-Gasteiz; and energy, in Bilbao. The main companies in the Basque Country are: BBVA bank, Iberdrola energy company, (both of them have their headquarters in Bilbao) Mondragón Cooperative Corporation that is the largest cooperative in the world, Gamesa wind turbine producer and CAFrolling stock producer. Basque cuisine is an important part of Basque culture. 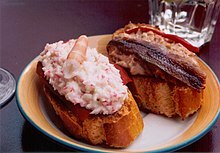 The most popular dishes are the seafood, fish (for exampleMarmitako) and the “Pintxos”, bar finger food. Basque food is one of the reasons for tourism to the Basque Country, especially the pintxos. A popular way to socialize is “ir de pintxos” or txikiteo, a Basque version of a pub crawl, albeit generally more civilized. The current laws configure the autonomous community as a federation of its present-day three constituent provinces. These western Basque districts kept governing themselves by their own laws and institutions even after the Castilian conquest in 1200. The new king upheld their institutional system issued from the consuetudinary lawprevalent in Basque and Pyrenean territories. This limited self-government, similar to the one for Navarre, was partially suppressed in 1839 and totally in 1876 in exchange for an agreement on tax-collection and a number of administrative prerogatives. These in turn were suspended under Franco for Gipuzkoa and Biscay, but restored by the Spanish Constitution of 1978. The post-Franco Spanish Constitution of 1978 acknowledges “historical rights” and attempts compromise in the old conflict between centralism and the different national identities (Basque, Catalan, and Galician). A specific approach to the national realities in Spain was eventually diffused by granting autonomous administrations and parliamentsto all regions of Spain (e.g. Castile and León, Catalonia, the Valencian Community, etc. ), while the Basques, Catalans, and Galicians were acknowledged historic specificity. Provincial governments (diputación foral) with actual relevant attributes (taxation, etc.) were restored only in the autonomous communities of the Basque Country and Navarre, after the latter detached from the Basque political process. The provinces in the Basque Country still perform tax collection in their respective territories, but with limited margin in decision making under the Spanish and European governments. Under this intricate system, the Diputaciones Forales (Basque: Foru Aldundiak) administer most of each of the provinces but are coordinated by the autonomous Basque Government (Spanish Gobierno Vasco, Basque: Eusko Jaurlaritza). The autonomous community has its own police force the Ertzaintza, controls Education and Health Systems, and has a Basque radio/TV station. These and only some of the powers acknowledge in the Gernika Statute have since 1980 been transferred to the Autonomous Community by the Cortes Generales under the Gernika Statute. The seats of the Basque Parliament and Government are in Vitoria-Gasteiz, so this is the capital city de facto, but the Basque Autonomous Community has no capital de iure. The Parliament is composed of 25 representatives from each of the three provinces. The Basque Parliament elects the Lehendakari (President) who forms a government following regular parliamentary procedures. Until 2009 all Lehendakaris (even those in 1937 and during the exile) have been members of the Basque Nationalist Party (Euzko Alderdi Jeltzalea) (moderate and Christian-Democrat) since 1978. Despite their continued leadership role, they have not always enjoyed majorities for their party and have needed to form coalitions with either Spain wide parties or left-leaning Basque nationalist parties, often governing in a difficult minority position. Since 1982 until the late 1990s, Basque nationalists ideologically closer to ETA refused to turn out in the Basque parliament, a significant wedge of the parliament. Currently, the Basque Government is headed by Iñigo Urkullu (PNV). In the 2012 Basque parliamentary election, the PNV obtained a plurality of the votes, followed by the left-wing nationalist coalition EH Bildu (Eusko Alkartasuna, Sortu, Alternatiba). ETA’s permanent ceasefire (2010-2011) opened the possibility of new governmental alliances and has enabled EH Bildu’s electoral success and rise to governmental institutions (Gipuzkoa, capital city Donostia). While a normalization could have been expected, the Basque political scene is currently gripped by a Spanish Government’s rigid, uncompromising stance and the disruptive effect of Madrid central tribunals’ (Constitutional Court, High Court, Audiencia Nacional) frequent and contentious meddling in Basque political and parliamentary decisions, as well as the increasing intervention of the regional deputy governors—directly accountable to the Spanish government—in Basque political and social life. This pattern is just about the same affecting nowadays Navarre. The statute, insofar as it is addressed and provides an administrative framework for the Basque people, provides the mechanisms for neighbouring Navarre to join the three western provinces if it wishes to do so, since at least part of it is ethnically Basque. The Basque Government used the “Laurak Bat”, which included the arms of Navarre, as its symbol for many years. The Navarrese Government protested, and tribunals ruled in their favour. The Basque Government replaced it with an empty red field. Navarre is one of the historical Basque territories and even claimed by the Basque nationalists as the core of the Basque nation. There are also two enclaves surrounded by Basque territory—Treviño (Basque: Trebiñu) and Valle de Villaverde (Basque: Villaverde-Turtzioz)—which belong to the fellow neighbouring communities of Castile and León and Cantabria respectively, for which a legal connection to the Basque Country has become an on-off matter of political discussion.